Khartoum and the Blue Nile at dusk. Khartoum (Arabic: الخرطوم Al-Khartum) is the capital of Sudan and is located where the Blue Nile and White Nile Rivers merge. The huge, spread-out city is actually made out of three distinct cities (Khartoum, Khartoum North or Bahri, and Omdurman) which are divided by the Nile and its two arms. The Blue Nile flows between Khartoum and Bahri, the White Nile between Khartoum and Omdurman, and the merged Nile between Bahri and Omdurman. The confluence of the Blue and White Nile, known as Al-Mogran, lies just north of the bridge between Khartoum and Omdurman. Khartoum proper is the seat of the Sudanese government and is the largest of the three cities. The older part of the city lies beside the White Nile while the newer parts, such as Al-Amarat and Khartoum Two, spread out to the south, across the railway line and the ring road, and around the airport runway. The city, both the old part and its newer extensions, is laid out mostly in a grid. Omdurman has a more Middle Eastern atmosphere with maze-like streets and is home to the huge Souq Omdurman. Bahri is largely industrial and residential. All visitors to Sudan need a visa and a passport as well as sufficient funds in cash. Please see the Sudan page for details. Current as of 04/18, there seems to be no trace of this $500 requirement. All visitors must register within three days of arrival and, if travelling outside Khartoum or taking photographs, obtain a combined Photography and Travel Permit. See the Sudan page for details. Visitors to Sudan must register with the police within three days of arrival. This may be done at border crossings though is easier in Khartoum. This may be done at an office midway the main road and the airport departure terminal. You need a copy of the information page of your passport and of the page with the Sudanese visa with entry stamp. There is a photocopy kiosk near the terminal hall (charges 2 SDG per copy). They did not ask for a photo. Process takes some 10 minutes. In January 2018 registration cost 535 SDG, payable in SDG. Khartoum Airport (KRT) is the main gateway into Sudan by air. The airport is served by various European, Middle Eastern and African airlines. Among the cities with direct connections for Khartoum are: EgyptAir (Cairo), Etihad (Abu Dhabi) Emirates, FlyDubai (Dubai), Ethiopian Airlines (Addis Ababa), Gulf Air (Bahrain), Kenya Airlines (Nairobi), Qatar Airways (Doha) Turkish Airlines (Istanbul). Sudan's national carrier Sudan Airways links Khartoum and several African and regional capitals, as well as with Sudan's domestic airports at Port Sudan, Nyala, El-Fashir, Malakal, Juba, Dongola, Wadi Halfa and El-Obeid. No departure tax from 2018. Go early as the airport can get a bit chaotic. Be prepared for long waits and queue cutting. Immigration checks and other security checks can also take a long time. No screens, no information, with separate security check queues for men and women. There is a bank facility to change money in the arrival and departure hall, also open during the night when there are flights. Getting there/away: Khartoum Airport is located close to the city in Al-Amarat. Taxis are available to any spot within the city, prices vary although locals may pay less. You can also walk out to the main road about 200 m from the airport terminal and catch minibuses that cruise along Africa Road. The main tarred road goes south from Khartoum to Wad Medani then east to Gedaref (for the Ethiopian border at Gallabat), Kassala (for the Eritrean border, currently closed) and then to Port Sudan. South from Khartoum, a road also goes to El Obeid, which then continues west towards the Chadian border via Darfur, to Al Fashir, which currently is a bit dangerous to use. From Al Fashir, you can head south to Nyala, and towards the borders of the Central African Republic. However, this route is VERY dangerous. From the north (Egypt), there are now two options to cross the border by road. One involves a ferry accross Lake Nasser from Abu Simbel to Wadi Halfa. It follows the East bank of the Nile. Another route from Aswan follows the West bank of the Nile and does not involve crossing the river. This new tarmac road (open since October 2016) goes directly to Khartoum. There are no road links to southern Sudan. The only option is to fly. The chaotic Souq al-Shaabi (GPS 15°31'44.45"N , 32°32'34.85"E) used to be the main bus terminal for long distance south-bound buses in Khartoum, but a new terminal has been built which is more orderly. On Google maps you can find this terminal under the name Khartoum Land terminal. Locals know the place as Meena al Barre. Beware of touts. While some of them can be helpful (they help you find the bus that is the first to leave and to get registered in case of need (e.g. for the route to the Etiopian border). A fee of 20 SDG for their service is acceptable. Buses leave for Port Sudan, Wad Medani and Al Qadarif (on the route to the Ethiopian border at Gallabat - Metemma), Kassala, El-Obeid and other cities. Going north long distance buses leave from Omdurman. Again, there are no buses to South Sudan. Buses from/to Shendi and Atbara (both of which can leave you at the Pyramids of Meroe on request) leave regularly from the Shendi Bus Station in Bahri (GPS 15°37'26.5"N , 32°32'37.6"E). Overnight buses from Aswan, Egypt arrive in Khartoum daily. Most of these buses stop in both Omdurman and Khartoum. Ask the driver where you want to be dropped off. Keep in mind there are two options for traveling by bus to/from Egypt. One route is direct Aswan - Khartoum (24 hours, 450 EGP one way). The other route is via Wadi Halfa (30 hours excluding a stopover in Wadi Halfa where most passengers stay overnight in a low-budget hotel (450 EGP one way busfare, reckon to pay 70 SDG for the hotel). Info January 2018. Railway lines link Khartoum with Wadi Halfa and Port Sudan via Atbara. Trains leave Khartoum main train station is in Khartoum North (Bahri). There are no boat services along the Nile to destinations outside Khartoum. Khartoum is both easy and difficult to get around. It is easy in that much of the city is laid out on a grid, with long straight roads and the airport and Nile as easy reference places. It is difficult in that the city (or indeed the 3 cities) are very spread out, making walking a long and tiring option. Maps are hard to come by, but Google Earth offers some good high-resolution images. These come in three flavours; bright yellow and often beaten up Toyota Corollas Model 1977, small 6 seater minivans, and modern comfortable air conditioned metred cabs (operated by LimoTrip 00249 183 591 313 or [email protected] - rates are reasonable by meter only and saves the haggling; the cabs are also radio controlled). Apart from metered taxis, taxi drivers always overcharge the foreigner and SDG 100 is the usual starting price for negotiations for short trips around town. It's highly recommended to take airport taxis to your destination as they are very safe at any time . Airport Taxi is available 24/7. Most of Taxi Drivers are friendly and helpful with tourists. SDG 30-40 to Riyadh or Afra Mall (renovated and now open after a fire had destroyed it). Since fuel prices have increased dramatically in 2014, prices have increased, but a determined haggler can still get away with a lower price. Minibuses are the cheapest way to get around Khartoum, especially between the three cities. There are easily thousands of minibuses and seeing all of them gather near the Great Mosque and Souk al-Arabi is a sight to behold. They are however quite complicated to use. None of them bear destination signs and you will have to be able to speak a little Arabic with their conductors to determine which minibus to take. Hand signals are also an important part of minibus travel in Khartoum. Conductors will indicate the direction by waving their open hand that way, e.g., from Africa Road they wave left for Arabi and right for Bahri. If you know your direction you can also wave in the same way and the bus will stop if travelling that direction. Buses are always packed to the brim. Fares are always SDG 2-3, even cross-river. Minibuses used to leave from the square near the Great Mosque (Mesjid al-Kabir) or nearby in Khartoum proper, nowardays however, Arabi Bus Station (15°35'39.3"N , 32°31'09.8"E) is the main confluence of minibus routes. Africa Road: Bahri - From south of the Afra Mall, past the airport, across Blue Nile Bridge to Shendi Bus Station and finally the minibus station/souq in Bahri. Africa Road - Arabi: From south of Afra Mall, past the airport, west on Al-Imam Al-Mahdi Road to Arabi Bus Station. Describing Khartoum's traffic as chaotic is a bit of an understatement. The current economic boom has seen many more cars on the road, although driving attitudes have not changed, resulting in almost comical chaos at intersections. As Khartoum is laid out in a grid, there are many intersections for cars from all directions to barge in to fight for space. Having said that, the slow speed of vehicles ensures that they are very few major accidents, at least in the city. If you are not used to such driving conditions, it is better to resort to taxis. Car hire is available and costs a bit above the African average, around 150 SDG per day for a Corolla, and 300 SDG for a 4x4 (with compulsory driver). However if you want to head off in to the desert the costs mount further, as the 100 km is standard, and then its 1 SDG per additional kilometre, hence a trip to the Meroe pyramids adds 400 SDG to your costs. Fuel, however, is cheap, at around 1.8 SDG per litre (March 2008). ‘Limousine’ is the Arabic for car hire – try along Airport Road or Ibed Khetim Road (east of the airport) for car hire places. Called "bajaj" (like in India) or "raksha", they are cheaper than taxis but more expensive than buses so about 20 SDG per trip. They are bestcan used for short trips within each of Khartoum's three cities. Rakshas are not allowed on any of the bridges crossing the river, so you must use taxis or minibuses if you have to cross the Nile to travel between the three cities. There are no ferry services between the three cities as they are well connected by road bridges. Nile Street and the Grand Holiday Villa Khartoum. Nile Street or Shari'a Al-Nilشارع النيل الخرطوم: Probably the prettiest street in Khartoum. With the Blue Nile on one side, the street is lined with pretty, albeit decaying-looking, colonial buildings, most of which are used as ministries, schools and even a hotel, the Grand Holiday Villa Khartoum. The Presidential Palace, also fronting the Blue Nile, is a pretty building but you will not be allowed to walk in front of it - the guards will ask you to cross the road and proceed behind and around the building. You will also see the modern side of Khartoum along this street - the egg-shaped, Libyan-owned Al-Fateh Tower; Chinese-built Friendship Hall. The National Museum is also along Nile Street. The road is tree-lined most of the way (except towards the west) and has a sidewalk, so walking is quite pleasant. Many people sit on the concrete walls along the river. Sudan Presidential Palace Museum This Museum is located in the grounds of the Presidential Palace and is housed in the impressive century old Palace Cathedral. The palace contains many relics and pieces related to Sudan's administrative and modern political history, from paintings of Sir Gordon Pasha to the Presidential cars of more recent rulers. The Changing of the Guard This is a ceremony held on the first Friday of every month, where the Black guard and the White Guard of the Presidential Palace swap over. The Ceremony is performed near the South Gate of the Palace. Confluence of the Blue and White Nile: If you have the stamina, you will reach the confluence of the two branches of the Nile if you continue walking west along Nile Street for about 3-4km from the Presidential Palace. The confluence is called Al-Mogran and it is best seen from the metal bridge (the old one, not the newer concrete one) linking Khartoum and Omdurman or Al-Mogran Family Park. It is said that one can actually see the two different colours from the different branches come together and flow separately for a distance downriver before mixing together. The Al-Mogran Family Park, located near the bridge is closed. Police might let you through the gate for a fee (20 SDG). Unclear if this is a scam, as the nearby shopkeeper issues 'a ticket' or rather a receipt. Warning: There is a signboard saying NO PHOTOS from the bridge. Please heed it as people have been arrested for taking photos of the confluence! Souq Arabi: If you want to see crowds and action, this is the place. The commercial heart of town, Souq Arabi (Arabian Market) can provide everything you need (see "Buy" section for more details on shopping options). The market is huge and spread over several squares in the center of Khartoum proper just south of the Great Mosque (Mesjid al-Kabir) and the minibus station. Come here to see Khartoumites go about their daily lives. Sudan National Museum Surprisingly impressive museum that has recently had a bit of a revamp. The large hall contains exhibits that rival those in the ancient Egypt sections of the British Museum or the New York Met, however if you’ve arrived in Khartoum fresh from temple gazing in Egypt things may look familiar. The gardens contain three temples relocated from Aswan. The joy of the place is that you’ll have it all pretty much to yourself. Best visit in the mornings, and give yourself 2 hours, tends to close at 12 noon but not reopen at 3pm, contrary to the sign on the door. Open from Monday to Friday. Entrance 10 SDG, Nile Street, next to the Friendship Hall, just west of the Libyan-financed Burj el-Fatih sail-hotel. Sudan Ethnographic Museum A fascinating little Museum on the corner of Al Gamaa street and Mak Nemir Avenue. This Museum explores the various cultures and traditions of Sudan's numerous ethnic groups. Displays range from intricate handicrafts to models of traditional homes. This museum is certainly worth a visit, if you have the time. Commonwealth War Cemetery Home to nearly 400 British Empire graves, the tranquil cemetery contrasts with Khartoum's busy streets. The cemetery mainly commemorates the 1940-1 East Africa campaign though has graves from as early as the mid 19th Century. Located in the North East of Khartoum 2 (15°35'49.0"N 32°32'15.4"E) Open from Saturday - Thursday, 7am to 2:30pm and free to enter. The war cemetery is a fenced area in a larger Christian graveyard that is interesting to visit as well. Souq Omdurman: Said to be one of the largest markets in Africa and you can get handicrafts here. The handicraft street is quite difficult to find - its towards the northern end of the market, near the gold section (not on the western side, as stated in the Bradt guide). The street is actually a covered lane between two buildings with gates at either end. Its not very busy (in comparison with the rest of the market) and they can lock up and go home in the evenings, and sometimes on Fridays also. The GPS coordinates are somewhere near 15°38'57.04"N , 32°28'56.75"E.
Bombed Al-Shifa pharmaceutical factory - a facinating place to explore, and well off the Khartoum tourist trail (if Khartoum even has such a thing). Tomahawked in 1998 the remains are an eerie reminder of Sudan's precarious relationship with the West. It's quite easy to reach (GPS / google earth co-ordinates 15°38'46.99"N , 32°33'41.60"E) get a minibus to Bahri, then get a taxi. The guards are quite friendly and will let you in for a wander - a contribution of 10SDG would be gratefully received. Saad Gishra - this is located in central Bahri and it is very similar to Souq Omdurman but it would be better to go there first as they are more likely to have what you want and at better pricing. There are many professionnal and international clubs spread around the three cities. Providing for sport, cultural activities or simply a place to meet, they are a lively remnant of British influence. Greek club. Khartoum 2, entrance off Mak Nimir Ave. The hideout of Sudan's greek community, it is open to the public and offers sports facilities (tennis, volleyball, basketball, football, running), a swimming pool (entrance fee 50 SDG) and basic food and drinks. Coptic club. this is where the Coptic Orthodox Christians socialize, this is especially true for the youth. This is also where a major part of the Coptic Orthodox Christians hold their wedding and engagement celebrations. German club. Nothing especially german, a basketball court, a garden in the shade of trees and a swimming pool. It also serves as an hotel. Indian club. Omdurman. The center of the capital's large Indian community social life, it organizes events for all important indian's festivals. A wander around Tuti island is highly recommended if you want to see green rather than the brown of Khartoum. If you are heading to Omdurman, a good way of unwinding after the chaos of the souq is to catch the ferry across to Tuti from Omdurman (except Fridays) or take the newly opened Tuti Suspension Bridge. Aim for around 5-6pm to enjoy Tuti in the early 7evening. A Nile cruise, several boats moored by Tuti Bridge are available for cruises. A cruise on some of the smaller boats can cost you as little as 15 SDG. Goethe Institute. Downtown, Al Mak Nimir St. Offers German courses, cultural events (music, art, litterature, conferences, movies). Ask for the program at: [email protected] or http://www.goethe.de/khartum. British Council. Downtown, Abu Sinn St. Offers English courses, cultural events (music, art, litterature, conferences, movies). Ask for the program at: [email protected] or http://www.britishcouncil.org/africa-sd-contact-us.htm. Evening tea on Nile Avenue. With the extension of Nile Avenue to Manshia complete, the stretch of road bewteen Mak Nimir and Manshia bridges has become the place to be of Khartoum's evening life. Innumerable tea ladies cater to the needs of the crowd enjoying the grass while watching the road and the river. Concerts. The Sudanese music scene is active. Artists of the moment play live in clubs, mostly on week end evenings. Look for the arabic posters that dot the city or ask the locals. Weddings. It is common for sudanese to hire star musicians to perform one or two of their favourite piece at wedding ceremonies. The footage of the performance usually ends up as an unofficial video clip on the sudanese TV channels. Creative events. Khartoum youth and amateur scene can be spotted at one of the numerous and often changing cultural events. Whether Wapi (British Council), Makaan, Space or Khartoum Open Mic', they offer a scene for young musicians, hip hoppers, dancers, slammers and poets. Most accurate information is to be found on Facebook. Khartoum International Music Festival. First tenure announced for the end of 2011. Cinemas. The last commercial cinemas have closed in 2009 but the open air buildings of the Coliseum (Souk al Arabi), Halfaya and Watania(Khartoum North) or Watania (Omdurman) can still be spotted. Afra Mall movie theaters still shows movies, mainly bollywood or egyptian. Film festivals. The European Union and the Embassy of Venezuela organize yearly film festivals. The French Cultural Center offers free weekly projections as does occasionnaly the Goethe Insitute. Note: Official exchange rates equate $1 USD to 18 SDG. The black market rate is $1 USD to 35 SDG (04/18) however exchanging money on the black market is illegal in Sudan and can be punished with up to 10 years in prison. Most shopping is still done in street markets or souqs. The souqs here are not as attractive those in other Middle Eastern countries but are still interesting enough for a glimpse of Sudanese economics. And you can certainly buy everything you need, including handicrafts if you are a tourist, from these markets. Prices are not amazingly low due to transport costs for imported (mainly Chinese) goods, but cheaper than in Afra Mall and Al Waha Mall or proper shops. Upmarket, Khartoum has two shopping malls with a supermarket, several shops and food outlets. Souq Arabi: Located smack in the city centre, this is your classical chaotic market teaming with people. The market is divided in to several sections, each focussing on a certain product. There is even one block devoted to gold, although it certainly looks less sophisticated and organised than its counterpart in Dubai. However, this souq is a bit lacking in term of handicrafts and fresh foodstuff. You are better off going to Souq Omdurman (see below) for handicrafts. Al Waha Mall: Located in the center near Souk al Arabi and Al Kabir mosque. It has a food court, a decent supermarket in the basement and retail outlets selling clothes and other things you would expect to find in a mall. The moving staircases did not work, but it is airconditioned. Souq Omdurman:: Very large Sudanese market. Most of the commodities are cheaper and vegetables and fruits are fresher than Souq Arabi. You can get handicrafts here. The handicraft street is quite difficult to find - its towards the northern end of the market, near the gold section (not on the western side, at stated in the Bradt guide). The street is actually a covered lane between two buildings with gates at either end. Its not very busy (in comparison with the rest of the market) and they can lock up and go home in the evenings, and sometimes on Fridays also. There are many local buses between Souq arabi and here. Bus fare are 1 SDG from here to Souq Arabi. The GPS coordinates are somewhere near 15°38'57.04"N , 32°28'56.75"E.
Saad Gishra:This is a covered market place, it is bahris main shopping market. Prices here can be a little higher then those in souq omdurman however it is much more easily navigable for tourists. Khartoum has a good sprinkling of restaurants, with new ones popping up every couple of months – other than restaurants attached to hotels there is little quality eating to be had in Khartoum’s city centre. Amarat hosts the majority of the better eateries, although Ridyah and Khartoum 2 also have some places. Omdurman and Barhi have a light sprinkling of simple restaurants. All restaurants have about 15% goverment tax and 3-14% service charge. Opera Restaurant Nile Street - inside Grand Holiday Villa Hotel. High quality 'international' cuisine, newly renovated, air conditioned, WIFI. Specialty in Pakistani / Indian cuisine. The most authentic Pakistani food in Sudan. Prices are competitive. Mat'am 15 Cha'abi - Popular Restaurant 15. Al-Amarat, St 15 (on the square off Macro Supermarket / Syrian Fresh Food 2, facing Kanon Hotel). Serves north of Sudan traditional gurasa (a large thick wheat pancake) or kisra (large thin pancake) with your choice of sauce (bamya based with lamb or chicken) or yoghurt with sugar (gha'ib). Also has a juice bar. Very cheap (many dishes under 20 SDG), it is a favourite of local workers and touk touk drivers. Amwaj Restaurant. Airport Road, Al-Amarat (on the corner with Street 15 or "Shari'a Khamsa ta-Ashaara"). Big, airy and spotless, and really good food. Extremely popular with locals and visitors. Menu offers shawarmas, kebabs, grilled chicken, lamb stews and others, all accompanied by bread, soup and salad. Delicious fruit juices and shakes too. Dishes cost between 120 and 180 SDG. Royal Broast. Airport Road, Al-Amarat. Another popular place a few doors from Amwaj. Laziz Delicious Restaurant. Al-Amarat Street 1. Nice place to eat in. They have another branch in Ryad area. Al Waha Mall - food court and coffee shops to cater for a variety of tastes. Try chopsuey at Wok n Fire if you like vegetables. Bawabi Tourist Restaurant. Khartoum 2 St 47 (east of Souk Khartoum 2). A reknowned table for spicy grilled chicken and broast. Mains cost 15-20 SDG. Hadramawt Restaurant. Khartoum 2 St 47 (west Souk Khartoum 2). Yemeni restaurant offering the traditionnal salta, fahsa, mandi, lahm hanith and fatah for desert. Mains cost around 15 SDG. Papa Costa. Located in the center of Khartoum, and reasonably priced. Service charges are minimal, food is reasonably good, but service level is so-so. You can choose food from steak to pasta. They charge 3% service charge and 10% government tax. Kandahar, souq libya Eating at Kandahar in souq libya is probably the most unique and authentic culinary experience in khartoum. The format there is rather different firstly you choose the meat that you want cooked usually a choice between camel meat and lamb, you then hand over the meat you have choosen to be cooked and prepared as part of a meal. Kandahar is one of the few places in khartoum where you can find camel meat. It is located in Souq Libya in the peripheries of Omdurman. It's best to prepare yourself to be alcohol-free for your stay: there are places serving 'special tea' dotted around and non-alcoholic beers are available, but in general it's more hassle than it's worth to track down alcohol during a short visit. For long-termers, the market does exist - via diplomatic bags and the black market but since punishments are harsh, this is not advised. Note that a 5% tourism tax and 15% VAT may well be added to your bill - Khartoum's hotels are inconsistent in telling you about these taxes in advance, and (especially for cheaper hotels) inconsistent in paying this money to the tax authorities. Remember to ask if there are any hidden extras before booking. Blue Nile Sailing Club. An alternative to Khartoum's hotels, on the river's southern bank just east of the confluence, the club often accommodates overlanders and accommodates tent camping on its grounds. The club is fenced, monitored, inexpensive and offers expansive river views. It is also home to a river gunboat that once belonged to Horatio Kitchener and now houses the club's offices. Khartoum Youth Hostel. House no 66 / Street 47, Khartoum 2, +249 183480385 or 0912500322 (mobile) Next to the Dutch embassy. Opened in 2007 and part of Hostelling International this is the best option for non-camping travellers on a budget. Interior is extremely basic but location, garden and number of foreign travellers tends to compensate. Also has safe parking and camping space. Beds from 70 SDG (01/18). Located at 15°35'28.7"N , 32°32'23.0"E.
Acropole Hotel  The oldest Hotel in town, warm, friendly and family hospitality situated in Zubeir Pasha street, in Khartoum near shops, banks and important business firms. All rooms are full board (Breakfast - Lunch - Dinner including taxes). Air-Conditioned rooms with direct dial telphone and big balconies. Acropole Hotel offers an international cuisine with Greek and Italian Specialities. The family will be able to arrange Visas for tourism which you can claim upon arrival. Bougainvilla Guesthouse  [email protected], tel 249 183 222 194 or mobile 249 226 154 45. Now (2016) moved to new premises. Small hotel in the Riyadh suburb – the big attraction is the breezy roof terrace where excellent European breakfasts and dinners are served. Although the rooms themselves are nothing special, they are clean and have the essentials of a/c, wireless internet and satellite TV, although standard rooms involve sharing a bathroom. A favourite with visiting aid workers and other westerners. 71 euro (approx US$110 / 200SDG inc taxes) for a standard room inc breakfast. Rotana. Airport Street, near Afra Mall. Tel: +249 1 87007777. Fax: +249 1 8700 7788. E-mail: [email protected] Opened in mid 2007, this is the only hotel in Khartoum that offers international five-star standard. Nice big rooms, perfectly equipped. Pool, gym, restaurant and lobby bar, conference facilities and Wifi (fee). Rooms are around USD 250/night / 1500 SDG. Grand Holiday Villa (Funduk al-Kabeer). Nile Street (Shari'a al-Nil). Tel: +249-183-774039. Fax: +249-183-773961. E-mail: [email protected] (Located to the west of the city center towards the confluence of the Blue and White Nile, along the banks of the Blue Nile). New management has taken over the hotel as of April 1, 2012 and is currently renovating the entire property. The hotel is undergoing extensive renovation at the moment and many facilities are being updated to international standards - it is expected to become the largest free WiFi internet hotspot in Khartoum. The swimming pool is the largest in Sudan and has been recently renovated. Features: Unlimited Free WiFi, Nile Terrace Restaurant (Water Sprayers on Year Round), Free Breakfast. The restaurant now serves continental and Pakistani cuisine - comes highly recommended. Rooms start at US$90 + VAT / Approx SDG 550 + VAT and include a continental buffet breakfast and free internet for all guests. Shisha is served with imported flavored tobacco for SDG 45 + VAT. This hotel is arguably the best value in Khartoum and offers the only rooms in Khartoum that overlook the Nile River. Rates are negotiable for long staying guests. All Major Credit Cards are Accepted at a 5% fee. This is the only hotel in Khartoum that will provide Credit Card facility for Room Guests only. Coral Khartoum. Tel: +249-183-774100. Fax: +249-183-775793. 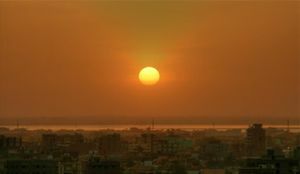 (Near the Al-Mogran Park and the confluence of the Blue and White Nile, about 3km to the west of the city center). Lets just get it out of the way - this Hilton is not part of the chain which Paris Hilton is supposed to inherit. It is locally owned and as such, its five star standards are those of Khartoum's. Rooms are a bit on the tatty side and the carpets need a wash; but the showers are strong and hot, the air-conditioning very good, toilets flush and the staff are very willing to help. Its coffee bar in the foyer seems to be a favourite hangout of the local business community while its indoor restaurant has a bit of catching up with the times to do. The best attraction in the hotel has to be the pool- and tennis court-side cafe, offering drinks, food and sheeshas. A popular hangout. Rooms start at US$180. Corinthia This new 250-room, 5 star hotel is undoubtedly Khartoum's premier hotel; the standard of service offered here is comparable to any 5-star hotel around the world. As well as being a hotel it has several restaurants and cafes, and a health centre and spa which are open to guests and membership holders. However, prices in this hotel are the highest in Khartoum - a standard room costs roughly SDG1500. Khartoum is one of the safest cities in Africa and the crime rates are low. The biggest concerns here are theft and car break-ins. However, regular precautions are advised. Travel different paths every day to avoid attacks, keep an eye out for pickpockets, don't leave valuables visible in your car. and keep out of large crowds. Sabaloga Gorge: This gorge is also known as the 6th Cataract. It is approximately 50 to 60 miles north of Khartoum and can be reached in about 2-1/2 hours. It is essential that a 4-wheel drive vehicle be used, and it is wise, as is true in all cases in traveling outside Khartoum, to travel with at least two vehicles. On arrival, visitors can stroll around a Sudanese village and inspect Ansar forts that once bombarded steamers on their way to relieve General Gordon. It is advisable to take this trip in the cooler months. Jebel Awlia: This dam was completed in 1937, and is approximately 25 to 30 miles south of Khartoum on the Jebel Awlia road. A 4-wheel drive vehicle is not required for this trip as the road is paved to the dam. However, if you intend to cross the dam and travel on the other side, a 4 WD will be needed. The area around the dam itself has a number of large trees and flat grassy land which are ideal for picnics. For those interested in bird watching, there are numerous birds to be seen, such as pelicans, herons, kingfishers, waders, plovers, etc. One of the fringe benefits of a trip to Jebel Awlia is a short drive up to the dam itself. Here the fishermen sell their catch, which they have just brought in. The prices are about half of what they might be in Khartoum. It is advisable to bring along suitable wrapping and ice/coolers for any fish purchased. Meroe: This site is approximately 200 miles north of Khartoum. There is also a hotel in Shendi (very basic) where one could be based. With a car, turn off the Shendi-Atbara road and drive along the track for approximately 1km to the pyramid enterence. There are some paved roads to Meroe but you do have to drive off the main road on to some sandy areas. Four-wheel drive vehicles are a preferable but not a necessity for this trip. Using public transport, take a bus from Khartoum to Atbara (see 'Get in' section above) and ask to get off at the pyramids which can be seen from the road on the right side. Returning to Khartoum it will be necessary but possible to hitchhike. The Pharaonic influence left its imprint in the hieroglyphic language, the religion of Amon, and building of the pyramids, which were a simplified version of the Egyptian model with no rooms or corridors. The Greek and Roman architectural influence is evident in the pillars of temples and the classical forms of the statues of men and women. 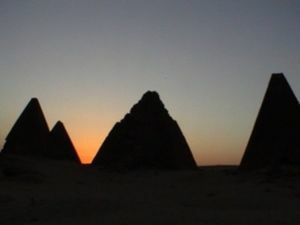 The Meroe ruins are a four-hour drive from Khartoum. But there are various other sites in the area, so a two- or three-day trip should be contemplated, and a knowledgeable guide is essential for the best understanding of the ruins. National Geographic’s book Splendors of the Past provides excellent background for such a trip. Guards may try to charge $25 entry each but with almost not attempt at bartering other than a genuine willingness to leave this will be dropped to 50SDG (01/17). The Pyramids can also be seen by simply walking around the perimiter. Dinder National Park: (12°19'N 034°47'E) The Dinder National Park is said to be one of the most unique in the world. It is totally “unorganized,” and the visitor can truly see game in its natural state. The site is about 300 miles south of Khartoum on the Blue Nile near the Roseires Dam. Travel by 4-wheel transportation from there to the park is recommended. Inside the park there is a small tourist area consisting of round, grass thatched huts. Inside these huts are beds, a chair and a table. The huts are burned and rebuilt every year after the flood season. This park is only accessible for a few months of the year from December through May. It is essential that the visitor traveling to Dinder make thorough preparations for the trip. The Red Sea Area - [Port Sudan]: The Red Sea is noted for its magnificent underwater diving, the clearness of its water and the variety of marine species. Visitors generally reach the area by flying Sudan Air. Daily 1-1/2 hour flights are available, but you may drive on paved road to Port Sudan in about 12-14 hours (510 miles). Travelers should be completely self-sufficient with all fuel as well as food and water. Visitors may want to stay at the Red Sea Hotel. This hotel is booked for most of the year, and it is necessary to have reservations confirmed in advance. The Coral Hotel is located about half an hour drive from the airport, along the harbor. Outdoor swimming pool, three restaurants, and a gymnasium are some of the facilities available. For more enquiries, call 31139810 or fax 31131183. Erkowit: This area has been recently reopened after a closure of several years. It is 39 km southwest of Port Sudan, and it is the only developed summer resort in Sudan. The altitude is 1,200 feet above sea level. Jebel Barkal Unesco World Heritage site - [Northern state]: Jebel Barkal or Gebel Barkal (Arabic: جبل بركل‎) is a very small mountain located some 400 km north of Khartoum, in Karima town in Northern State in Sudan, on a large bend of the Nile River, in the region called Nubia. Around 1450 BC, the Egyptian Pharaoh Thutmose III extended his empire to that region and considered Gebel Barkal its southern limit. Thutmose III campaigned near the city of Napata, which became the capital of the independent kingdom of Kush about 300 years later. In the 8th century BC, the 25th Dynasty Nubian king, Piye, conquered Egypt, greatly enlarged the Napatan New Kingdom Temple of Amun, and erected his Year 20 Victory stela within it. The ruins around Gebel Barkal include at least 13 temples and 3 palaces, that were for the first described by European explorers in the 1820s, although only in 1916 were archeological excavations started by George Reisner under a joint expedition of Harvard University and the Museum of Fine Arts of Boston. From the 1970s, explorations continued by a team from the University of Rome La Sapienza, under the direction of Sergio Donadoni, that was joined by another team from the Boston Museum, in the 1980s, under the direction of Timothy Kendall. The larger temples, such that of Amun, are even today considered sacred to the local population. For these reasons, the mountain, together with the historical city of Napata and other ancient sites, were considered by UNESCO, in 2003, World Heritage Sites. Buses leave daily from Khartoum to Karima, However, the most comfortable and convenient way of getting there is by car. The route is tarmaced, but you will still require the best part of a day to get there. This page was last edited on 9 March 2019, at 14:53.